Q: Where are you guides an manuals? Q: How do I set up the mat? Plug the controller into the mat and then plug the other end into a power outlet. Press the power button on the controller and set the temperature to your desired heat. If your mat has the PEMF or Photon Lights turn those features on right before you go on the mat. Q: What temperature should I use the mat at? A: We suggesting starting out at 40-50 degrees Celsius and then if you wish to have your mat warmer turn the temperature up to a maximum of 70 degrees Celsius (Note: these are internal mat temperatures and surface temperature is less. Q: Can I use all the mat therapies together? A: All therapies are meant to be used together. To receive the benefits of the photon therapy the light must be shining on your skin. If materials such as the mat covers or clothing are blocking the light you will reduce its effects. Q: How long should I use the mat for? A: We suggest to at least use the mat for 15-20 minutes daily. People usually use the mat twice a day for around 20 - 30 minutes . There is no problem in using it more since all the therapies are safe for extended use as long as you do not have the temp too high. We do have some people who sleep on the PEMF which is why we have the 20 minute timer on the PEMF. The PEMF is on for 20 minutes and then goes to sleep for 100 minutes and the comes on again. This way the person will get 4 treatments /night. When the PEMF goes to sleep, the indicator light still stays on so it difficult to determine where you are in cycle if you are not watching the time. If you want a 40 minute PEMF treatments just reboot the controller by toggle everything off and then pushing all the buttons for another round of 20 minutes PEMF cycle. Q: How do I use the mat covers? A: The mat comes with 2 free optional covers and a foil blanket. The thin and thick covers are water proof and made to protect the mat from sweat when people were using their mats as an infrared sauna or at higher temperatures. They do not need to be used all the time. Thin cover- designed to allow the photo light to shin thru so you receive the photon light therapy. Q: Can I sleep on the mat? A: Yes you can, the mats have up to a 12 hours timer so you can leave it on overnight. We suggest setting the temperature much lower than sleeping on the mat so you don’t get too hot. Q: Can I use the mat on my bed? A: Yes you can, all the mats can be placed on top of your mattress or under a thin topper. 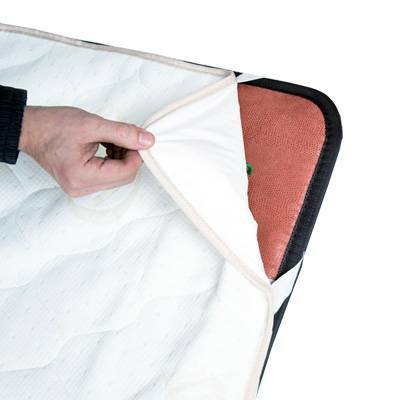 The mats containing the PEMF feature can only be placed on a firm mattress so the PEMF coils do not get bent. Q: What is the best PEMF mat to sleep on? A: The Queen and King sizes PEMF mats are designed to sleep on all night. They come with a thick cover to make them even softer and more comfortable. These mats still have the other therapies in the mat- far infrared waves , negative ions, photon therapy and the crystals . Q: What should the mat be covered with? A: You can cover the mat with any type of sheet, blanket or towel. This will help keep the mat clean and protect your skin from the direct heat of the stones when the temperature is high. Q: How do I clean the mat? A: Wipe it down with a non-toxic cleaner. Q: Can I use the mat for my pets? A: Yes, the mat will have the same positive effects on your pets as it will with you. Make sure to put a cover on the mat to keep it clean and do not let your pet chew or scratch the cable, controller or mat. We suggest setting the temperature to a lower heat setting such as 40-50 degrees Celsius. Q: Where does the Far Infrared Heat ( FIR ) comes from? A: The Far Infrared Heat is generated when the crystals are heated up. When certain crystals (amethyst, jade & tourmaline) are heated up they generate Far Infrared Heat. Q: I am very sensitive to EMF’s. How can I use an electrical mat? A: Our mats are made with EMF shielding material so all unwanted EMFs are blocked when you are laying down on the mat. Certain mats also have PEMF technology which can reverse the damaged caused by EMFs. Q: Is the PEMF (Pulsed Electro Magnetic Field) technology real? How does it compare to more expensive PEMF mats such as the iMRS and Beemer? A: Yes, the PEMF technology is real. The PEMF technology in our mats is as good or better then what is found in other PEMF mats such as the iMRS or Bemmer. We use the most overall beneficial and optimal type of PEMF as based on hundreds of independent studies. Q: How to Healthy Wave Mats compare to other cheaper stone heating mats found on the internet? We use real high quality crystals such as high quality amethyst from Brazil. Our mats are made with EMF shielding material to block all the unwanted EMFs from the electrical wiring. We provide a better warranty including a 1 year warranty for the mat itself and a 5 year warranty for the controller. We have optional PEMF technology and low level laser light therapy in our mats. In the rare event that you experience pain and/or discomfort, immediately discontinue use and consult with your physician. Pregnancy/Breast Feeding – Consult your doctor or health practitioner to see if you should be using a heated mat. If it is ok to use a heated mat we suggest only using it at a lower temperature if you are pregnant or breast feeding. Implants – Metal pins, rods, artificial joints or any other surgical implants generally reflect infrared waves and thus are not heated by this system. Nevertheless, you should consult your physician prior to using an infrared mat at high temperatures. Active Bleeding – Avoid using the mat on high mat temperatures as it may increase bleeding in open wounds.